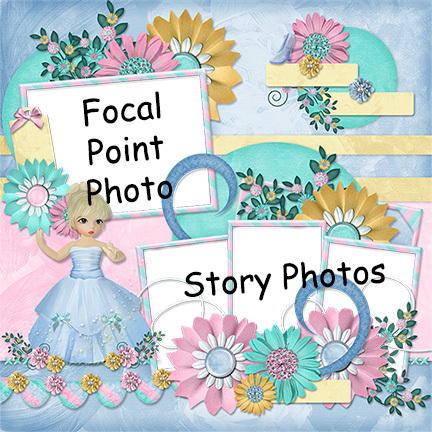 MyMemories Blog: Designer Tip by Syrena's Scrap Art! Designer Tip by Syrena's Scrap Art! Tell a story with your layouts. First gather your photos for the layout. Lay them all out and decide which one is the focal point. And use the others as secondary photos to tell the story. I created this Quick Page with that in mind. This Quick page can be used to tell the story of a meet and greet with Cinderella. The upper left hand photo would be the pretty posed photo of you or your kiddo with the princess. The photos in the bottom right would be the fun photos snapped while getting her autograph, the excitement of seeing her for the first time, and the fun private conversation with the princess before or after the focal point photo. Used the word boxes to add a title or words that capture the moments. Keep in mind the concept of using a focal point when creating your layouts and have fun! As always come and visit my shop for all kinds of fun kits and Quick Pages!